Seppi’s lunging squash-like forehand pass on match point is the shot fated to make the highlight reels, but it wasn’t indicative of the match (especially since Federer played a strong, decisive point). A far more indicative shot was the high floating backhand with which Seppi took the second set tiebreaker: instead of executing an easy volley into the open court, Federer left the ball, and looked unimpressed when it dropped onto the line. For the most part Seppi was solid, happily pushed the number two seed around while playing well within himself, and remained unflappable where so often before he has flapped. Federer afterwards offered no excuses beyond the concession that sometimes you just have a bad day. As for Seppi, he has probably played better in previous losses, but you can only take the chances you’re presented with – many don’t – and it couldn’t happen to a nicer guy. Rafael Nadal’s bad day occurred two days earlier, at night, when a laughably kind second round against American qualifier Tim Smyczek threatened to turn nasty. Those who’d feared this match was a virtual walkover were duly reminded that Nadal has lately struggled against players ranked outside the top hundred. Apparently his troubles are such that he’s now sick of the very sight of them. He was fine for a set, but thereafter began to experience acute discomfort: nausea, dizziness, bewilderment, Weltschmerz; the whole shebang. 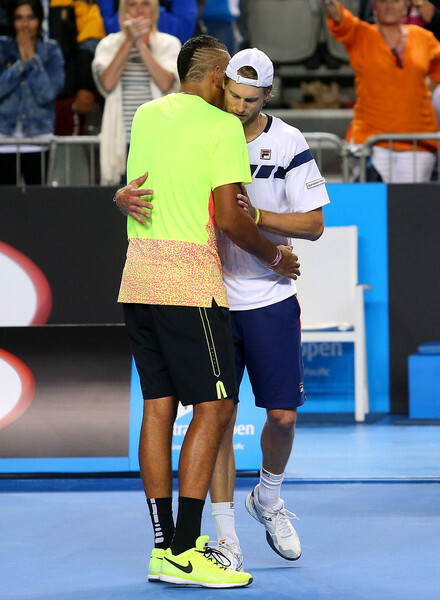 Smyczek valiantly seized his opportunity, darting to a two sets to one lead while Nadal was doubled over groaning. Much was subsequently made of Smyczek’s sporting gesture late in the fifth set, when he instructed the umpire to give Nadal another first serve after the previous one was marred by a shout from the crowd. It was pretty classy, and Nadal afterwards couldn’t say enough kind things. It would be nice to live in a world in which such gestures were commonplace. Alas, common courtesy isn’t, and Smyczek is a rare gentleman, which he further proved in his post-match interview. Nadal’s reward for surviving the diminutive world No.112 was a third round date with the even smaller world No.106 Dudi Sela, whom he found a way past whilst shedding only six games. His fourth round opponent Kevin Anderson was ranked about 90 places higher, and for ten and a half games played like it. Alas in the eleventh game Anderson gained no fewer than five break points on Nadal’s serve. Failing to convert these sent him into a black funk from which he emerged an hour later to discover Nadal was up two sets and break. Nadal’s water bottles blew over at one point, providing momentary interest. He’ll face Berdych in the quarterfinals, against whom he hasn’t lost in nine years, a period that includes seventeen straight wins for the Spaniard. Kyrgios’ opponent will be Andy Murray, who until the fourth round had travelled so far under the radar as to be undetectable, especially if you’ve been searching on Rod Laver Arena. That said, none of his matches had merited centre court billing, and he was drawn in the same half as Federer, Nadal and most of the Australian men. His fourth round against Grigor Dimitrov deserved a bigger court, however, and through four sets both men ably demonstrated why. Even as Kyrgios was being canonised by the Hisense burghers, Murray and Dimitrov were assembling a highlights reel in real-time. Momentum careened about until the very end. The Bulgarian served to send the match into a fifth set – Kyrgios is an expert at the mechanics at play here – but comprehensively stuffed it up, and never recovered. Murray broke and again and served it out, whereupon he was punished with an interview with Hamish McLachlan. Notwithstanding his second serve, which looks more meek than ever, he is otherwise showing the sceptics that great form in lead-up exhibition events can actually be translated into great form in a meaningful tournament. If he gets through Kyrgios – one imagines he will – he’ll probably have another opportunity to prove it against Nadal. Great stuff Jesse. Reading your articles is so much fun.